Handmade dolls are something special, because they are made with care and with much love, especially if you think of your grandchildren, who can with their unwavering love brighten your single day. 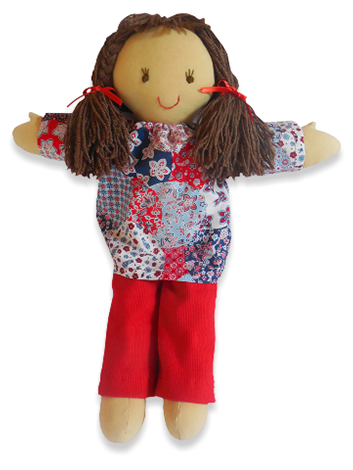 Handmade dolls have a soul, they are suitable for play, for company, and for joy. Dolls are a wonderful companion through childhood and beyond; they develop the child's imagination and remind the elderly people of their childhood, they arouse pleasant feelings in us. Karin Neuschütz wrote in the book about dolls that, "the dolls are the child's second ego. When they play with them, they can express their feelings or process already experienced." All my dolls are made from natural cotton material with polyester filler, which gives it soft feel, and the eyes and mouth are embroidered.